How to use the Glasgow Coma Scale calculator? Glasgow Coma Scale is one of the most important and fundamental scales in medicine used by almost every doctor to estimate patient's consciousness. Thanks to our GCS calculator, you also can do it in just three simple steps! Check out also our other calculators with essential medical scales, such as the Apgar score or the MELD score! In 1974, Graham Teasdale and Bryan J. Jennett, professors of neurosurgery at the University of Glasgow, published an article in Lancet - one of the most influential medical journals - in which they described and proposed a new scale to assess coma and state of consciousness. Since that time, due to its simplicity and feasibility, it has become an incredibly popular tool. Moreover, the GCS score is used as a part of other medical scales and scoring systems, such as Revised Trauma Score or APACHE II. in all patients in Intensive Care Units. Out of each test, you can get from 1 up to 4, 5 or 6 points respectively. The sum of values of the test is a GCS score. Let's look at the example! Adult male after brain injury opens eyes when you speak to them, and can hold a conversation, though seems disoriented. Patient flexes elbow and wrist when you put pressure on the nail bed. GCS of 8 or less indicates to intubate a patient. GCS was not originally intended to be converted into a single score. Moreover, some researchers take issue with the scale's poor inter-rater reliability and lack of prognostic utility. It is worth noticing that the same GCS score will predict different mortality depending on the components, e.g. GCS of 4 with the components 1+1+2 (Eye+Verbal+Motor) predicts a mortality rate of 48% while GCS of 4 with the components 2+1+1 (Eye+Verbal+Motor) predicts a mortality rate of 19%. Nevertheless, GCS is a routine and widespread test, which remains a standard of care in many clinical situations. 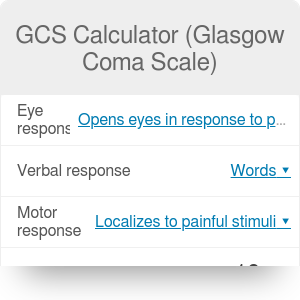 GCS Calculator (Glasgow Coma Scale) can be embedded on your website to enrich the content you wrote and make it easier for your visitors to understand your message.